Party like an Amazon! 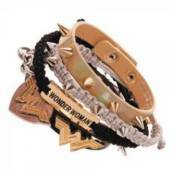 For anyone without magical cuffs, make your wrists shine with the power of Wonder Woman. This Wonder Woman Arm Party Bracelet Set features a collection of Wonder Woman themed bracelets, including her iconic logo.